Enjoy more photos from our friend Merrie and her creative grayeyard scene. We witch you a Happy and Bootiful Halloween! Trick or Treat? If you were to take a peek into our busy lives on any given day, you will find us squeezing in a few minutes here and there to catch up on what’s been posted on Instagram! We admit, we’re Instagram junkies! Though we actually do find our inspiration for our Blog and YouTube Channel directly through Instagram! We find it a combination of Pinterest and Facebook all in one! The beauty, makeup, style, fashion, food, recipes and décor, pics & tips have kept us rather busy trying to keep up with what’s trending so that we can bring it all back to you! We are very excited to share our newest find with you and thought words just wouldn’t do it justice. We had to do a video so that you can see first hand how fabulous this Beauty find, Beauty Kitchen, really is! Be sure to follow us on our YouTube Channel Here ! 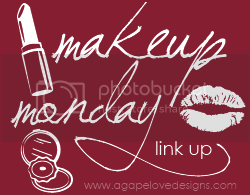 Check out some of our friends and their Makeup & Beauty Posts! Though there really is no such thing as going over the top when it comes to Halloween decorating. Props must be given to our friend Merrie who keeps it wicked fun, yet frightfully tasteful. We love the spooky mix of Happy Halloween wreath, and cheery Trick-or-Treat pumpkin banner with oh-so-creepy skulls and bones scattered unexpectedly in little nooks and crannies. Spider webs, vampire blood and potions set a haunting mood on the mantle. No fire here, just an eerie skeleton graveyard, complete with a black crow lurking in the distance creating that creepy-crawly, mirthful feeling that puts the fright into Halloween night! Bwahhhahahahaaaa! Don’t you just love Pinterest? We do! Check out this 4 ingredient Halloween candy bark recipe we found. Our favorite combination of sweet, salty, and spooky! Kit Kats, pretzels, candy corn, and chocolate doing the monster mash in your mouth. YUM! This is definitely a snack that we will be taking to our Halloween celebrations, the kids LOVE it! Put a spin on it by adding different combinations of candies, or even colored chocolate to give it your signature. Easy, eye appealing and so yummy, it’ll rattle your bones! Melt chocolate chips by microwaving for 40 seconds at a time and stirring vigorously. Be careful not to burn, you’ll find the chips will start to melt from their own heat. Lay out a baking sheet with a piece of parchment paper over it. Pour melted chocolate into baking sheet and add kit kats, pretzels, and candy corn all over. Place in refrigerator for 30 minutes to set. Enjoy!